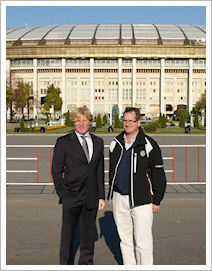 TPL has been commissioned to design a new golf academy at Moscow's Luzhniki Olympic Complex. The landmark development will introduce golf to Europe's largest sports centre, venue of the 1980 Olympics and 2008 Champions League Final between Manchester United and Chelsea, and which boasts facilities for more than 40 different sports with five million visits per year. The new golf academy will include a new 9-hole par-3 golf course, driving range, practice putting, family adventure golf, plus a spacious clubhouse with indoor golf simulators. Among the Russian sports stars who have benefited from the facilities at the Luzhniki Olympic Complex are tennis aces Yevgeny Kafelnikov and Marat Safin. The question is, could Russia's first golf star emerge from Luzhniki's new golf academy?